B: Bill Miller: What Was He Thinking? Bill Miller is a photographer based in New York. 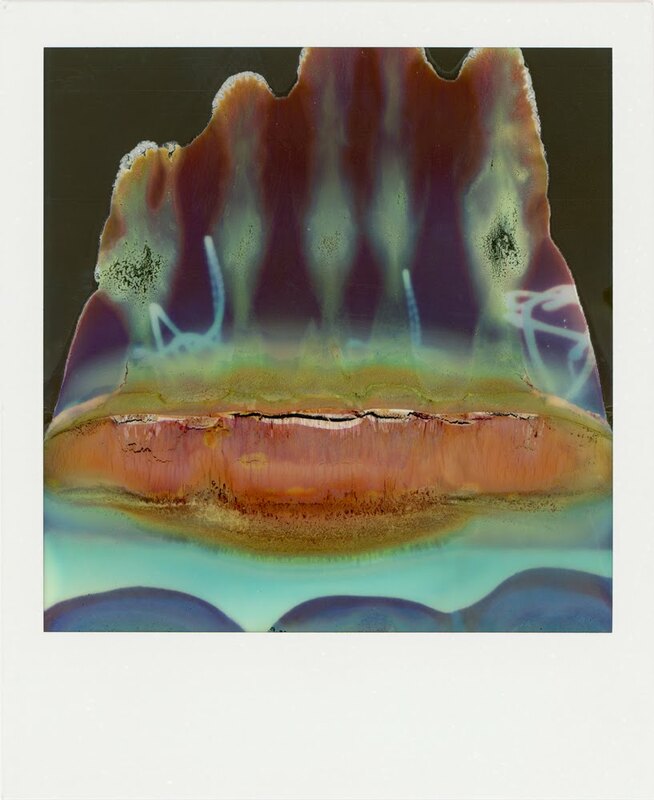 More images from his Broken Polaroids series can be seen here. "What this whole projects starts with is a partially broken camera. Fortuitously and totally by chance it is broken in a way that’s productive but the flaw that has given it that extra dimension has also robbed it of its initial purpose. This camera won’t take pictures but it will use something that resembles a photographic process mixed with the violence of ruthless gears and rollers to make these unique images." 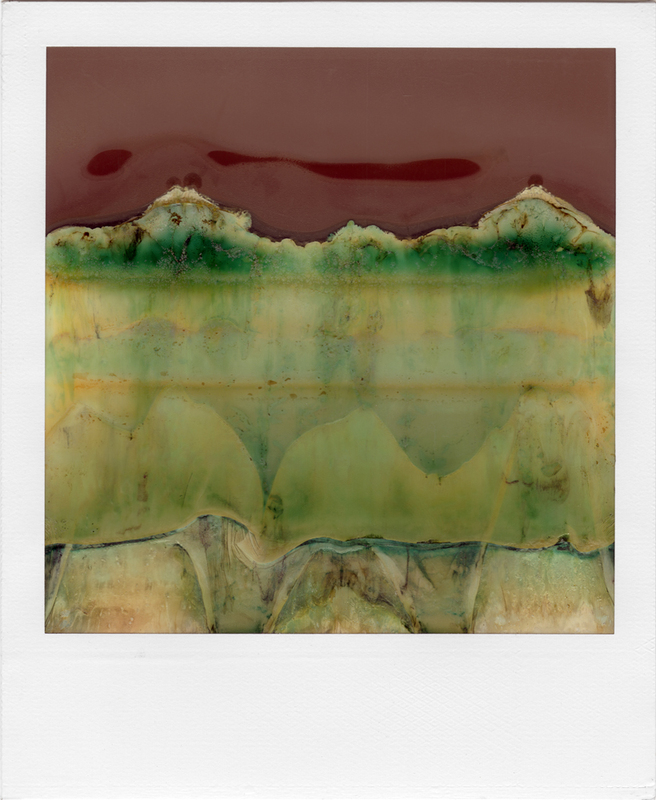 "Now, I’m a photojournalist so when I am looking for these Polaroids to fail that means that I want them to fail spectacularly and iconically. I know theoretically what’s happening but I want it to be visually compelling. That’s what you’re seeing here. The camera spit out 2 pictures at once and the gears ground over the center of this one. There’s no room for 2 pictures between the rollers and I had to grab the end of the picture and wrestle both of them out. At first, most of the image was blue. I was discouraged and threw it into a drawer. 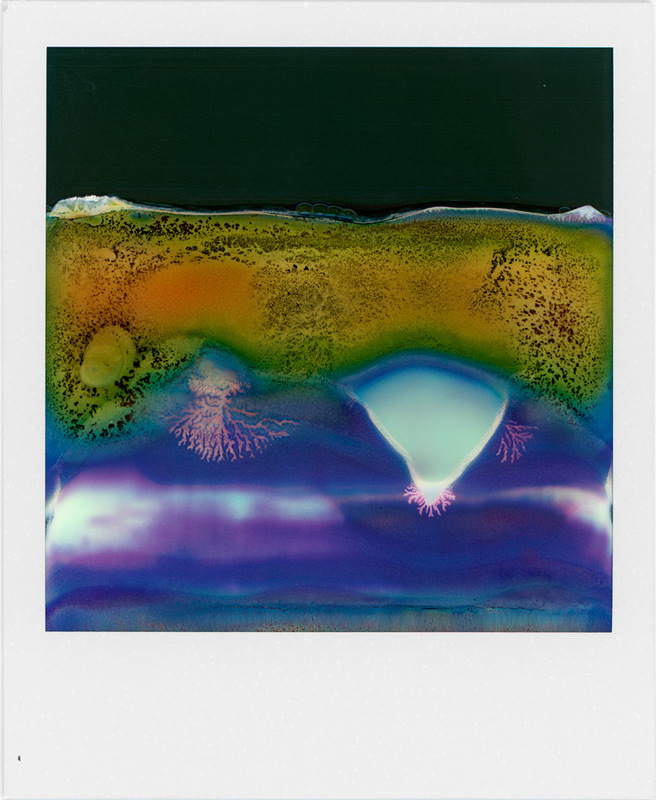 Polaroids used to come up in a few minutes. Now, it takes weeks for it to be fully developed. Colors darken and sometimes change, usually for the better. About 2 weeks later I pulled it out and most of the blue had turned orange with these streaks that looked like a topographic map of the desert. I must be some kind of genius, I thought." "The camera is pretty indifferent to what I put in front of it though I insist on pointing it at things. I often think that if I traveled through time and photographed famous events throughout history, the camera would be totally apathetic to the gravity of the event. The Kennedy assassination, the French Revolution, the murder of Socrates, all rendered in broken smooshed colors that didn’t seem to be in front of you when you took the damn thing. In front of the camera: Cleopatra committing suicide. 'Oh, I’ll take a picture of this. What the? Looks like grass on the moon. Stupid camera.' "
"This is the photographic equivalent of a Rorschach test. Most people tell me this is two elephants in mis-matched espadrilles eating a pizza in the business class section of a Lufthansa flight to Frankfurt but I don’t see it. The pizza, I mean." "This picture allowed me to do a self-portrait in a way that I felt compelled to for many years but was too embarrassed, especially while my mother was still alive. A broken camera doesn’t know what it’s pointed at. It cannot detect intention. A broken camera knows nothing about our desires and transgressions. It is an unreliable traveling companion. A silent witness." "Polaroid SX-70 is an expensive endeavor. It always has been. When I was young I had a pretty sound set of excuses that made it seem ok for me to steal it from chain stores. I lost track of those excuses years ago. Around the same time they started keeping the film behind the counter. These days I’m paying about 3 bucks a picture, so when I’m plowing through the film and I’m literally seeing dollar bills shoot out of the front of the camera and I have nothing to show for it, I get desperate. Even though I work with this camera quite a bit, every time I release the shutter, I’m in a white-hot panic like someone just dropped a baby. I’ll think to myself 'The chemicals didn’t get spread around at all. This isn’t going to work. I don’t know what the hell I’m doing.' I’ll run the picture through the rollers twice or more to get some kind of image out of it. The rollers move the drying chemistry around and it bunches up with little folds - thousands of little folds. At first, it looks like a cat threw up on it. 'Is that even good? Is that what I want?' Disgusted, I throw it into a drawer. When the chemistry settles down and colors darken, I look at it a couple of weeks later I think 'I must be some kind of genius.' "
"People always say to me 'That one looks like a Rothko painting' to which I reply, 'Do you think he’ll be pissed?' "
Garbage. Pure and simple, no matter what words you put with them. @Anonymous, If you're going to trash someone's photos you should have the balls to put your name behind it. Sorry about not using my name the first time. I was pissed. photography.... no (just used emulsion rather than paint). It's relatively easy to create this sort of thing using the same technique Miller uses. It is however very difficult to withstand the criticism that ensues. The true artist will be able to let his work stand on it's own and not take anything personally. An artist has to view his own work like it's a complete sentence written on the page of a book. It's there for everyone to see and nobody can change it. I don’t find the idea or the results very interesting. Photograph: From the Greek words phos meaning "light", and graphis meaning "ruthless gears and rollers"
I love these pictures, they are very much like abstract expressionist paintings. See the work of Helen Frankenthaler and Mark Rothko (not the contributor above, but the painter). To compare abstract art made through the chance operations of broken equipment to my paintings is an insult. Stand in front of one of my paintings until you understand the difference. As visual objects I find these very pleasing. It seems tough to escape the "what is art" conversation. I don't have a personal answer that I feel could stand up to rational scrutiny nor that would lean towards an objective, not subjective, stance. However I think some interesting questions on that topic are raised by these images. 1. Is it possible to be art when the creator of the piece is not in control of the entire result? As an outside example, John Cage's performance where the sustain pedal is held on a piano but no keys are pressed. The eventual resulting sounds are all the piano strings vibrating in response to the audience's small sounds (movements, coughs, mutterings). Here the creator is intentionally wielding a tool with the intended outcome being 'art' but his use of the tool allows chaos to largely influence the result. 3. Are these works purely visual or is there concept around them? It's difficult to point at conceptual art of any sort and declare it "not art." But I am curious if (tying into the comment above by Mortimer) Miller's response to criticism would be focused on the graphic/visual qualities (which I personally find evocative) or if these pieces are intended in part to be a piece of dialog or statement where the statement/conversation is integral to the piece being 'art' (Richard Prince comes to mind, but surely there are much better examples). I'm very curious how opinions fall out on these topics. Personally, I like the pieces regardless of where they fall in the academic "is it art?" debate. Anonymous may be partially correct: These pictures are sort of garbage. I’ve been shooting this SX-70 film my whole life and from my experience at least 5% of the time the images fail for one reason or another. Sometimes the chemistry is old and sticky. Sometimes the camera malfunctions. It’s a part of using Polaroid and over time you stop noticing. 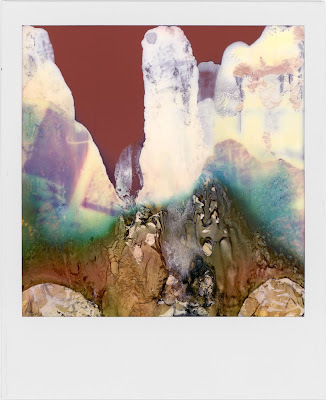 The ruined Polaroids get discarded with the packaging, a statistical casualty of such a complicated mechanism. It was only when my statistical casualties jumped to nearly 100% that I realized that even against my will, this camera was making, totally by chance, some interesting, and occasionally beautiful pictures. It’s this kind of unpredictability that makes old cameras and processes appealing and it wasn’t until I noticed what was happening that I started saving them. 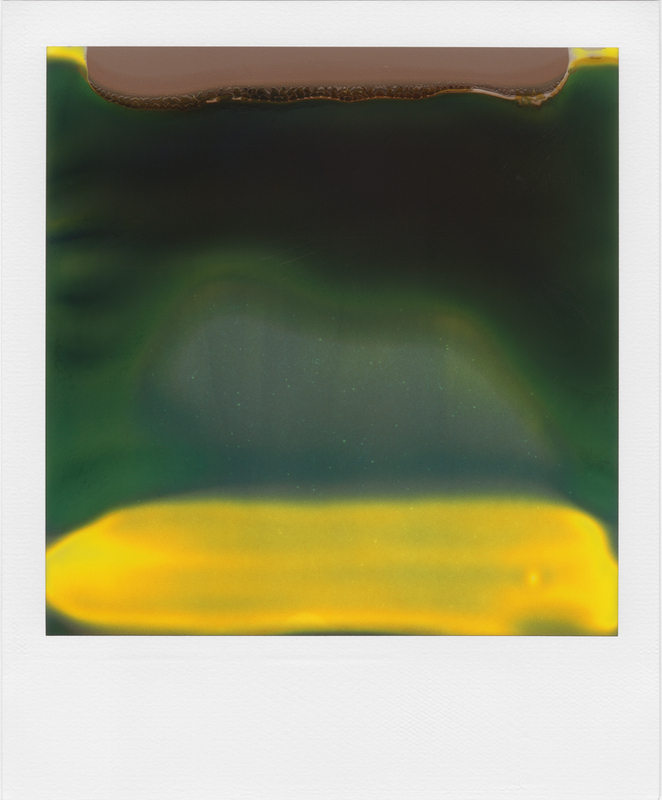 I must have thrown out scores of ruined Polaroids over the years. I imagine that millions around the world have probably been discarded, unappreciated, since that camera was first introduced 39 years ago. Now, I'm not sure whether intent constitutes art is a good argument to have here. Everything that's ever been photographed has existed in the world before that moment. We don't create the image, only the frame. My broken Polaroid camera is a tool that works a certain way (think of a Diana). Not the way it was intended but in a way that destroys pictures. I work within that constraint to make these pictures. The things I point the camera at become the palette for the mangles pictures. If you look at the tumblr blog you can see the variety of pictures I end up with. 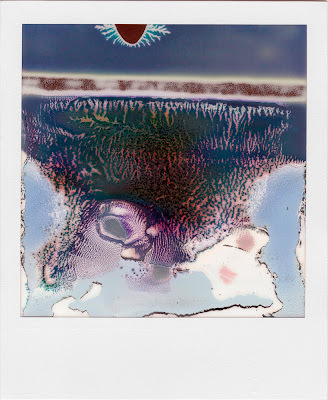 Of the 50 or so polaroids that I found worthy of sharing there are probably 5 different categories of ruined polaroids. All of them use light and a photographic process so are probably photographs but I think the question of what is a photograph is a huge one surrounding this project, especially because so many of them can be described as "painterly." This is the concept. An beloved but antiquated photographic medium gets a second chance and becomes the intersection of photography and abstract expressionist painting.